Avg. Group Discount of 10.8%! Miami Midtown hotel in the arts district, near downtown. 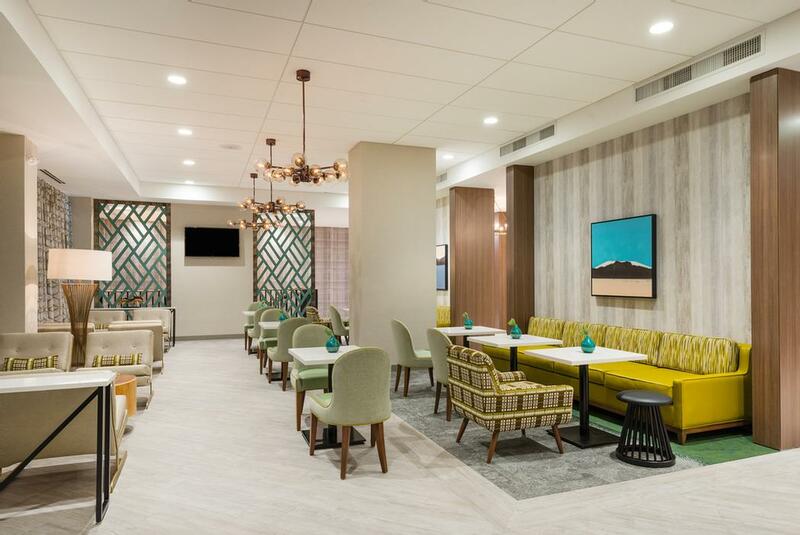 Hampton Inn & Suites Miami Midtown, a new hotel in the up-and-coming arts district, is just 5 miles from downtown and 8 miles from Miami Airport. We also offer easy access to I-95 and I-195. Guests boarding a cruise ship can rest easy knowing our hotel near the Miami Cruise Port is located just a few miles from Dodge Island. Enjoy a vibrant Miami experience – from our friendly multi-lingual staff and local artists' paintings on display, to a year-round outdoor pool. Enjoy free access to our business center and fitness room, open when you need to print a job after 5pm or get an early morning workout. Free coffee, tea and WiFi are available in the lobby any time. For a training seminar or a small gathering, our Dolphin and Marlin meeting rooms accommodate up to 62 people. Join us for a free hot breakfast daily, including kid-friendly options. If you're in a hurry on a weekday, grab a free On the Run™ Breakfast bag. Lunch and dinner are only a three-minute walk away to local Miami restaurants. Unwind in your guest room using free WiFi while reclining on your clean and fresh Hampton bed®. All of our rooms include a mini-fridge and coffeemaker, 40-inch LCD TV plus a work desk and ergonomic chair. Upgrade to a suite for additional space and a sofa bed, microwave and wet bar. Accessible rooms are available, too. Individual and Group reservations Cancellation Policy may vary according to the needs of the hotel. 30 Days prior to arrival non refundable policy will be apply. Complimentary Buffet Breakfast or Continental Breakfast. Valet Parking only. $25 for Sleeping Guest. $15 for visitors. Parking rates for groups vary depending on amount of event or sleeping rooms. 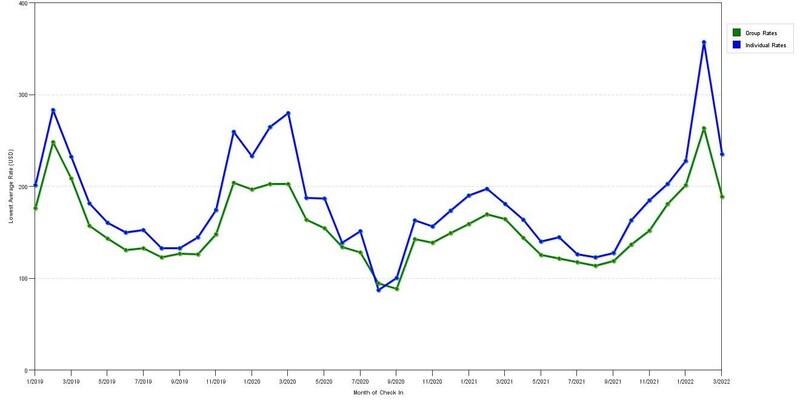 The graph above is fluctuations of room rates for both group quotes and the lowest online individual prices our rate checker could find at the time the group/meeting offer was entered. The lowest group or meeting displayed is 14.8% in the month of February 2020 and the highest average individual rate is $351 in the month of February 2020. This chart will show past seasonality and also project future months. If you are flexible with dates, you may want to consider staying at Hampton Inn & Suites Miami Midtown in a month when rates are lower. 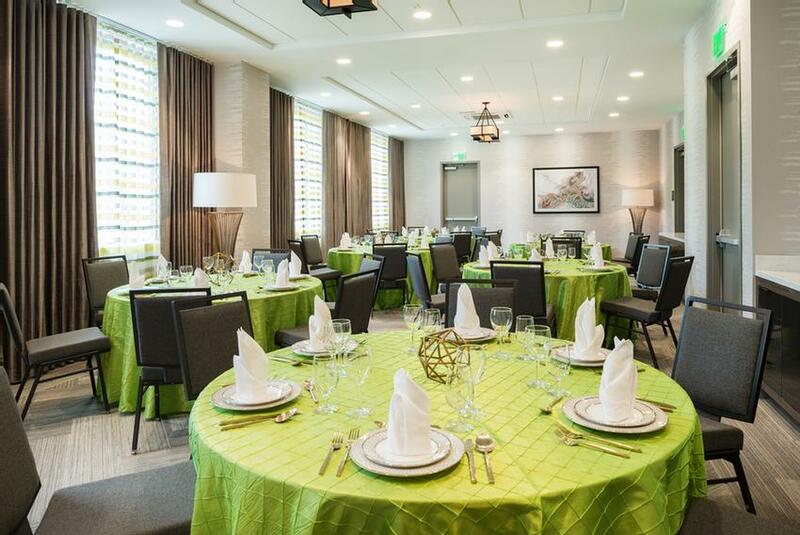 Below are the meeting, banquet, conference and event spaces at Hampton Inn & Suites Miami Midtown. Feel free to use the Hampton Inn & Suites Miami Midtown meeting space capacities chart below to help in your event planning. 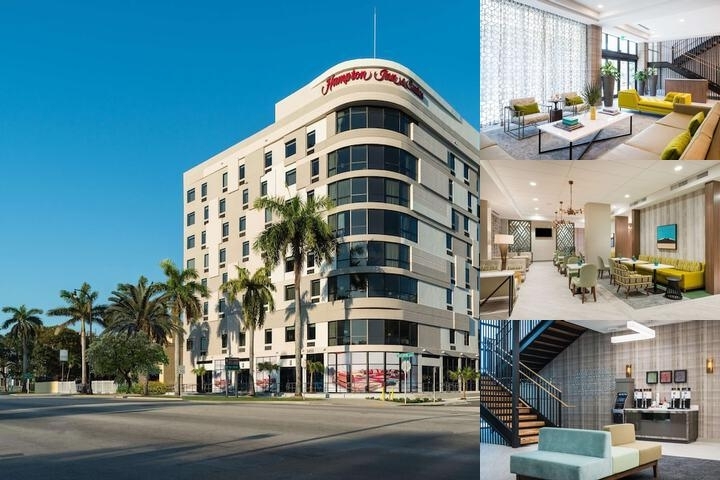 Hotel Planner specializes in Miami event planning for sleeping rooms and meeting space for corporate events, weddings, parties, conventions, negotiated rates and trade shows. 47 x 18 x 10 Ft.
For Meeting Space rentals of 2 or more days there is a 10% discount. 22 x 21 x 10 Ft.